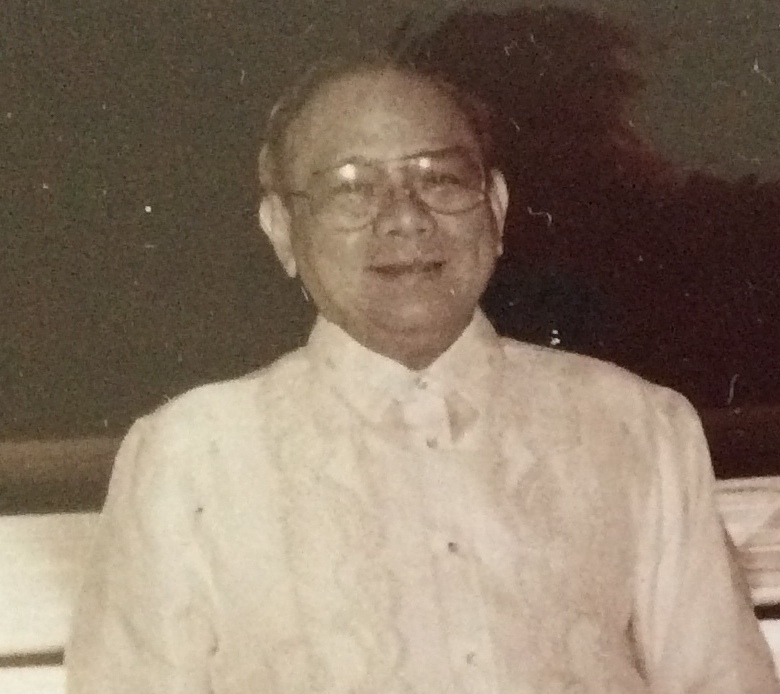 I mourned my father’s death on the plane back to Manila. He had died in his sleep, my mother said, after a tremendous snore that may have been a groan, a sigh, a mourning of his own for the two children far away that he would not see before he breathed his last. I learned of his death at a third remove, while checking messages on our answering machine and suddenly realizing that the undercurrent of panic and pity in the voices of my best friend and sister-in-law implied that yes, my father had died. Hours later, having waited for the time difference between West Coast and Manila to move into a decent hour for disturbing what must have been a sleepless night, I called my mother and confirmed the news. Mama said he had let loose a deafening snore; she had failed to shake him awake. She called in Neneng the cook, who lied and said she felt a faint pulse. Mama called her physician brother who examined Papa, and offered truth. Your father is dead, she said. Come home now. Living abroad, you are forced to view life back home through a diffused lens. You hear news of the niece or nephew turning a year old, of your grandmother celebrating her 90th birthday, oblivious to the grand festivities erupting around her, of your parents slowly and inexorably aging, ailing, expiring. It is all a blur to you, seen through a pane of frosted glass, always a few hours or days after everything has happened. Afterwards, you are left with the image of your family at home, gathered together in grief or joy but somehow incomplete, for always there is that space in the photo between your mother and your younger brother where your face should have been. Come home soon, my brother had entreated, days before my father had passed away. He looks now like Grandma did, just before she died. Come now. He needs you here. My brother and I, prodigal children lost to America and American spouses, had assured the family we would come soon and assumed my father would wait until we crossed the Pacific Ocean. But there are some things that simply will not wait for the homecomings of expatriate children. Death is one of them. We could not return in time for any of the nights of the wake. My high school classmates came despite my absence, cheering my widowed mother – or at least confounding her – with their reminiscences of how she would chaperone our parties dressed her glamorous caftans, sitting at the foot of the stairs and watching us through a scrim of cigarette smoke. Meanwhile, my husband and I sank into the cold opulence of Northwest’s Business Class, a gift from my father, who insisted that his newest grandchild arrive in style on her first trip to Manila. I wept through three movies and four meals, across a half dozen time zones and the Continental Divide. How else does one kill time on the flight home for a funeral? I thought I had squandered all my sorrow – or at least the visible part of it – and could expect to be suitably composed during the funeral mass. Heat and an unexpected summons to deliver the Second Reading provoked the most hideous facial contortions, that failed to contain a fresh surge of tears. To contain my anguish at not having been home when Papa died. After the cremation, there was not much left to do but sort through his belongings. My father had not left a will: a curious oversight for someone who usually filed things in triplicate. Instead, my mother gave each of us a large brown envelope he had kept, with our names on it. Inside I found a hodgepodge of artifacts from my childhood: my third grade report card (A for conduct, B- for handwriting), a few childish drawings, Valentine cards to my parents, copies of my college transcript and some pictures. It was as though my father had been trying to capture and file away the essence of me, of each one of his children, before we all grew up and left him behind. Two of my siblings had stayed close to home, but Chito and I had absconded to America, there to live separate lives, which intersected only during my parents’ infrequent visits. Another odd thing my brothers unearthed in the depths of his closets behind old suitcases and such, were a box of guns, some loaded: armalites and sub-machine guns and hand pistols, with a cache of bullets for each. Perhaps Papa had feared a siege on his home, one similar to the attack his own family had fled during World War II. The siege never came of course, but we fled anyway — to other parts of the country and over the seas, escaping life as we knew it to forge our own destinies. So the guns gathered dust, and my father compiled folios on his lost children. We had known for years that he was ailing. Each photo we received showed him slightly more stooped; each visit home revealed yet another complication. My brother bought him a few more years’ life by donating a kidney after both of Papa’s had failed. Sheer stubbornness and a probable heart attack killed him off in the end. After a serious fall outside the Power Plant movie theaters, he seems to have suffered a stroke. He could not move his left arm, and his speech was severely slurred. Still, he insisted on leaving the hospital the very next day. That was the last time the doctors had their way with him. He died soon after. Towards the end, Neneng, our loyal cook, told me Papa would drag around the house raging, Why me? Why me? After years of helping to dress, bathe and medicate him, even my mother was exhausted. Why me? She must have wondered herself. I wonder only if things might have been different had I been living in Manila. Could I, the favored daughter, have bullied him into enduring the ministrations of a doctor? Could I have eased his depression or rage at his body’s progressive decline? Could I have helped postpone his passing until we were all gathered round the bed? At this point, I will never know. And like all expatriates who were not present when that one life-changing event took place, I bear a burden of guilt. I was not home. Not for the birth of my first niece or second nephew, nor for the death of my father. Forgive me Father, for I was not there. The guilt is an ache I bring away with me to the airport, along with the boxes of woven placemats and jusi fans and various other souvenirs that prove that California and American passport notwithstanding, I am still a full-blooded Pinay. It is a silent burden that weighs heavily more days than others, mainly when I remember one or another odd thing about my father. Sometimes my infant daughter will smile with a cheek-ful of food and turn into the spitting image of her Lolo. Or I may hear Sinatra crooning on the radio and recognize the song as one of those we put in my parents’ 40th wedding anniversary video. Or I will remember how a lifetime ago, on some forgotten beach at sunset my father had calmed my youthful uncertainty about the future. Who knows, he said. One day you might even write a book. Thank you Marivi, for remembering and reminding. What a beautiful and heartfelt post, Marivi. Thanks for sharing it. I ask myself the same questions, almost everyday: Had I been there in Tehran five years ago, could I have saved my father? Would he have lived a longer and happier life? I don’t think I’ll ever know. I think it is the eternal question for all expatriates – if things might have turned out differently if we had stayed home. Thanks for reading!